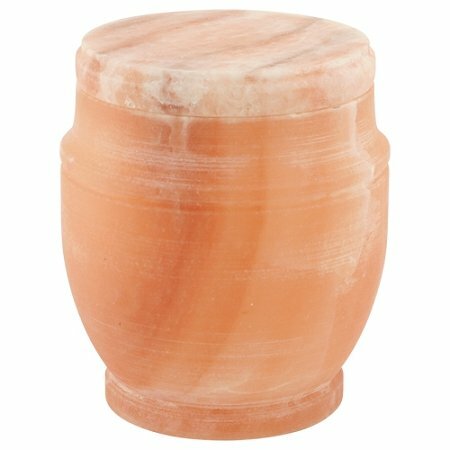 With a warm, glowing color and unique texture, the Himalayan Rock Salt Biodegradable Urn is made of a completely natural material, salt, that is quite sturdy and substantial until placed in water where it will dissolve within a few hours. Handcrafted from a solid block of salt, Himalayan Rock Salt Biodegradable Urn is a popular choice for ocean burial as it returns the remains of a loved one along with primeval salt back to the elements of our earth. The salt of which this urn is comprised is estimated to be 250 million years old. The Himalayan Rock Salt Biodegradable Urn can also be used for ground burial in soil, the urn will biodegrade within three months. Given its handcrafted nature, the urn may vary slightly in size, shape, and appearance from the image displayed. A water-soluble bag is included: cremated remains are placed into the bag, then into the Himalayan Rock Salt Biodegradable Urn. Quality Materials and Finishes That Will Last for Years. Standard Shipping is Fast and Free. 100% Satisfaction - Guaranteed to Give You Peace of Mind. Save Hundreds of Dollars Over Funeral Home Prices. Available Direct from the USA Leader in Memorial Products. If you have any questions about this product by Silverlight Urns, contact us by completing and submitting the form below. If you are looking for a specif part number, please include it with your message.